He was an athlete who’d been to the pinnacle of his profession, but now Genaro “Chicanito” Hernández was dying. The two-time world champion super featherweight boxer, whose only two losses came at the hands of Oscar De La Hoya and Floyd Mayweather Jr., had been diagnosed with a rare and fatal form of cancer. He barely had a penny to his name, and his time was running out. But he had a warning—a warning about a man he had considered both a friend and a trainer, a man who was godfather to his son, but whom he maintained, at the end of his life, had wronged him. Hernández was quoted making similar allegations in a Spanish-language interview with ESPN Deportes. In that 2011 article, he said that he’d given Guerrero $200,000, and that Guerrero said he’d pay it back in monthly increments of $4,000. But, Hernández told ESPN, he never saw a dime, and Guerrero vanished. Contacted for comment about Guerrero’s relationship with Hernández and the alleged investment, Guerrero’s attorney, Jake Hinkins, said, “These are allegations Mr. Guerrero would vehemently deny.” Several days after Boston contacted Hinkins, the WBF removed its article about Hernández. A WBF spokesman says the story was taken off the website because the author no longer works for the organization and the timing was a coincidence. Hernández’s wife, Liliana, told Boston that her entire family trusted Guerrero. After all, Liliana said, the man spent years helping Hernández become the champ by crafting his training and nutritional regime. “He befriended the whole family,” she said. “And he was there for so many years, and he was involved with us around critical times in my husband’s career.” Liliana said she didn’t know the specific details of her husband’s investment, but she recalled that it involved a vitamin-related business that Guerrero said he was launching. Soon, the family had unrelated tragedies to deal with: A landslide hit their home in Southern California; Hernández’s mother passed away. Then, the mighty Chicanito was diagnosed with cancer. When Hernández passed away, his family could not afford a funeral. Floyd Mayweather stepped up and paid for the services. Today, Guerrero is in business with another world champion—an athlete at the top of his game who counts Guerrero as his “body coach”, best friend, and the godfather to one of his sons. Unlike Hernández, though, Tom Brady has nothing but the best to say about Guerrero. And in the wake of Boston magazine’s investigation into Guerrero’s past, Brady—who is Guerrero’s business partner in in TB12 Sports Therapy Center in Foxboro—continues to publicly defend Guerrero. 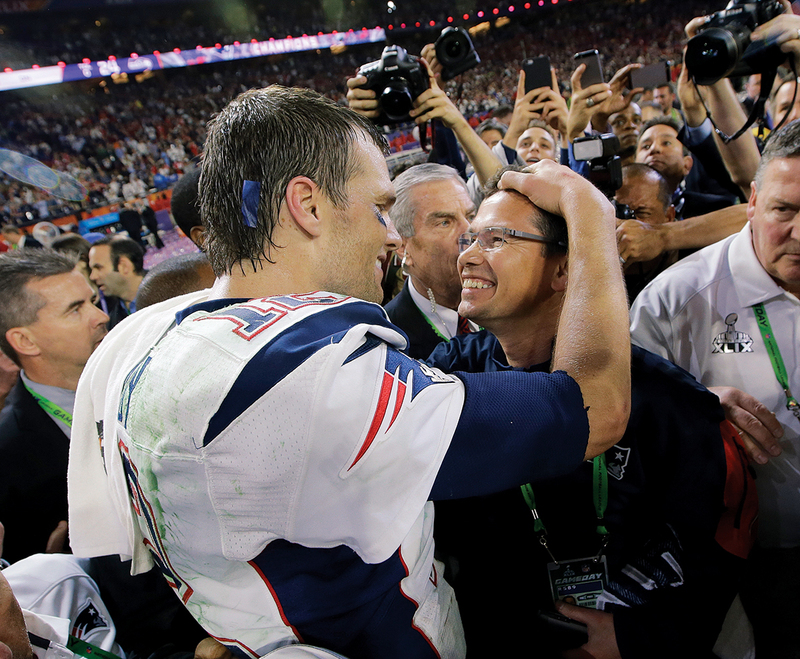 “He’s been an incredible influence in my life,” Brady told WEEI when pressed on the relationship. “And I think we’re doing something really special with our business.” But as Boston has uncovered, Guerrero’s past is fraught with more legal troubles than perhaps even Brady was aware. As we revealed last week, Guerrero had two run-ins with the FTC. The agency sued Guerrero for making false claims about a nutritional supplement called Supreme Greens; investigators found that an informercial about Supreme Greens— in which Guerrero was consistently referred to as a doctor— falsely claimed Guerrero had conducted a 200-patient study, and had misled consumers into thinking that the product could cure ailments such as cancer, diabetes, and heart disease. As a result, the FTC fined Guerrero $65,000 and barred him from ever claiming that he was a doctor or from making unsubstantiated medical claims regarding any food, drug, or dietary supplement. The FTC also required Guerrero, for a period of five years starting in July 2005, to disclose the agency’s enforcement decree to any future business partners in ventures for which Guerrero was a majority stake holder. Then in 2012, as we reported, Guerrero was again investigated by the FTC. In a letter to Guerrero’s attorney Hinkins, the FTC reported “serious concerns” about a drink Guerrero was marketing called NeuroSafe, which claimed to be able to help prevent—and speed recovery from—concussions. “Among other things,” the FTC wrote, “users relying on [Guerrero’s] unsupported claims might forego appropriate medical treatment and return to competition before they have adequately recovered from their injuries.” The product bore endorsements by Brady and then-Patriot Wes Welker; its label boasted that NeuroSafe was “powered by TB12.” In its letter, the FTC said it had found that Guerrero had no scientific evidence to support NeuroSafe’s “extraordinary claims.” The FTC took no action against Guerrero after he had stopped marketing the drink and had offered refunds to anyone who’d purchased the product. Now, Boston has discovered that while Hernández never took legal action against Guerrero, others did: Two lawsuits in Utah show that half a dozen investors alleged Guerrero committed fraud and swindled them out of hundreds of thousands of dollars. The actions described in the lawsuits take place after the FTC had sanctioned Guerrero for Supreme Greens but before the agency had contacted him about NeuroSafe. According to one lawsuit, Guerrero wooed investors with claims that Brady and other athletes had a financial stake in the company, and said the company would benefit from the endorsement of Brady and a new line of cosmetics marketed by his wife, supermodel Gisele Bündchen. The company, headquartered in Highland, Utah, was a health products outfit called BioForce that marketed and distributed—among other items—a pain relief cream called MyoMed. Guerrero, according to the Utah Department of Commerce, is listed as BioForce’s President, Director and Officer. And the two lawsuits, filed in Utah district court, alleged that Guerrero had engaged in fraud. The allegations—which Guerrero denied in court— were straightforward: Guerrero lured investors by invoking Brady’s name, and used their money for his own enrichment while preventing the investors from voting on company matters as promised. The first lawsuit, filed in October 2010, alleged Guerrero convinced a man in Utah named Michael Eisinger to invest $300,000 in BioForce. Eisinger claimed that Guerrero used company money “to pay for personal expenses, including a Porsche, an Audi, and extravagant trips” and unilaterally made decisions without giving him, as a shareholder, his right to vote. Furthermore, the suit alleged, Guerrero failed to inform Eisinger of his troubled past with the FTC, as Guerrero was required to do per his settlement with the agency back in 2005. Guerrero denied the allegations in court filings. When contacted, Eisinger said that the case settled and declined to comment. Court records show that the case concluded by August of 2011, less than a year after the original complaint was filed. Eight months after Guerrero settled with Eisinger and the case was dismissed, Guerrero found himself the target of another lawsuit alleging fraud. This time, there were five plaintiffs who claimed they had collectively invested $427,500 into BioForce. As in the first lawsuit, the plaintiffs alleged that Guerrero took their money and spent it on fancy cars and swank trips, and claimed that they were stonewalled from ever being allowed to vote their shares. In order to attract investors, according to the complaint, Guerrero falsely claimed that he had sold his previous company for $500 million and had already passed up an opportunity to sell BioForce for $50 million because he claimed it “had the potential to be a billion dollar company.” As in the first lawsuit, Guerrero denied the allegations and the case settled and was dismissed in February 2015. The details of the settlement are not public. Little is known about the day-to-day operations of BioForce. None of the five investors involved in the second lawsuit responded to requests for comment. Bob Shawgo, a former vice-president of marketing at BioForce, said the company was “above board” during his roughly two-year-long tenure, adding that Guerrero “treated his employees very well.” From what Shawgo could tell, the company simply couldn’t grow as fast as Guerrero had hoped. According to the second Utah lawsuit, Guerrero told investors that BioForce’s products would be promoted by Brady. That claim appears to have come true: It looks as if MyoMed—BioForce’s flagship product— is now sold under the name MyoNatural. Today, the first thing that comes up when you visit MyoNatural.com is a picture of Tom Brady, and a testimonial from him that reads, “I use MYONATURAL because I have no time for pain.” The website also includes endorsements by NFL all-pro running back LaDainian Tomlinson and Willie McGinest, both of whom have been Guerrero’s clients. BioForce still owns the trademark on MyoNatural, according to United States Patent and Trademark Office website. The second lawsuit also alleged Guerrero told investors that Brady, along with Tomlinson and women’s pro basketball icon Lisa Leslie, had invested their own money in the company. In an email, a spokesman for Tomlinson denied that the former running back ever invested in any business deals with Guerrero, and said Guerrero “was part of [Tomlinson’s] team of people that kept him on the field and healthy. He had a great relationship with [Guerrero] and has nothing negative to say about Mr. Guerrero.” A message to what is listed as Leslie’s home was not returned. Brady’s agent did not respond to a detailed list of questions for this story. It’s unclear whether Brady was actually an investor in BioForce, as Guerrero allegedly told the plaintiffs. If Brady was never an investor and Guerrero lied about Brady’s financial ties to BioForce, why then would Brady go into business with a man who tried to profit from Brady’s celebrity without Brady’s permission? If Brady was an investor in a company whose principal was twice sued for fraud, why would Brady continue his business relationship with Guerrero and open TB12 together?